Hello Everyone!! It's Lindsay from the DT here with you today, and I have six, yes SIX, cards to share with you using just one digital stamp set. Recently, there were three amazing "room" sets that were released and there are so many great images included in each one, I wanted to share with you just a few of the ways you can mix and match to create some awesome cards! Be sure to watch the video tutorial below for all the details! Because I have so many cards to share with you, I don't have a write up for each one. So, if you want all the details on how each individual card was put together, be sure to watch the video tutorial above. Below, I have quite a few pictures to share with you of the entire set of cards! 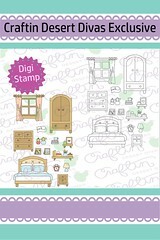 As I said above, there were three large "room" digital stamp sets that were recently added into the CDD Shop. 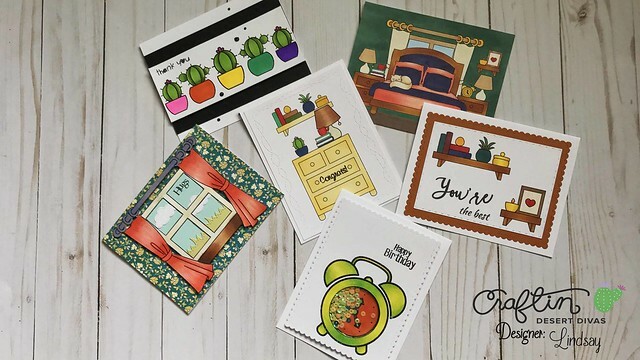 I chose to use the Bedroom Digital stamp Set, but there are also Kitchen and Living Room sets that are also available and perfect for creating scenes as well. These large room sets are amazing for creating scenes, like I did with two of my cards above. But, there are so many other great things you can use these images for. Like I did above I used two images over and over (the cacti) to create a fun thank you card. Also, I used the window image, along with die cuts to create a fun window scene. The clock I die cut and created a shaker card for something different. And finally, I used the shelves by themselves to create a CAS card perfect for any occasion! Now I used the Bedroom Accessories digital stamp set, but be sure to check out the Kitchen and Living Room Accessories sets as well. 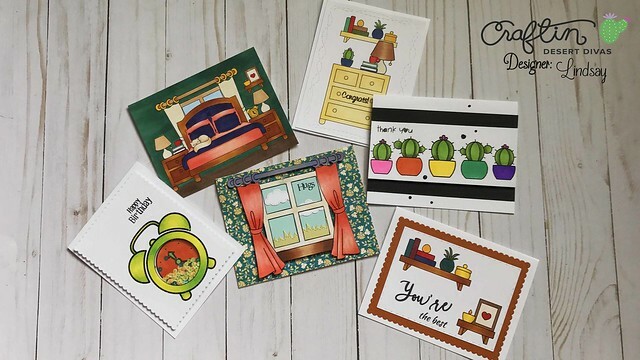 There are so many great images that can be used on their own, with other digital stamps, or other CDD stamp and die sets to create amazing cards! 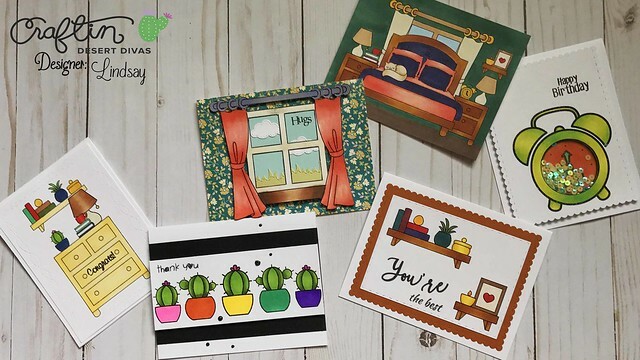 If you have any questions about the CDD products I used on my many cards today, you will find them all linked up below. Thanks so much for spending some time with me today! 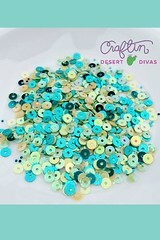 Until next time, Happy Crafting! !